Size: Up to 6 feet tall and almost as wide, more or less. Growth Form: Forb/herb, subshrub, shrub; caespitose or spreading although sometimes erect, plants smooth or tomentose. Leaves: Green; leaves in basal rosettes and cauline; narrowly linear or elliptical; leaf margins entire or sometimes undulating. Flower Color: Yellow fading to reddish; sepals and petals collectively referred to as a perianth; stamens exserted; fruit glabrous. Flowering Season: April to September; June to September in Texas. Elevation: 5,000 to 9,000 feet. Habitat Preferences: Dry rocky slopes and ridges, open areas, rocky places in Pinyon (or Piñon)-Juniper , Ponderosa-Pine and higher elevation communities. 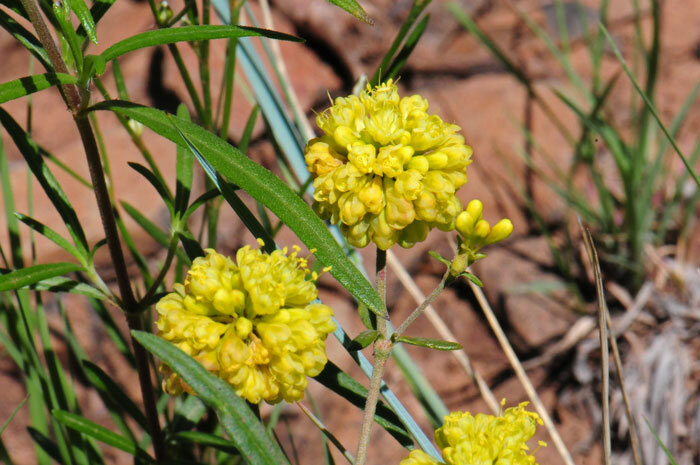 Recorded Range: Eriogonum umbellatum is found in the southwest and northwest North America in; AZ, CA, CO, ID, MT, NM, NV, OR, UT, WA, WY and in Canada; AB, SK. In Arizona it is found in the northern ½ of the state. North America & US County Distribution Map for Eriogonum umbellatum. Genus Information: Eriogonum is found throughout North America with approximately 230 species and 446 accepted taxa overall. World-wide, The Plant List identifies 255 species in Eriogonum. 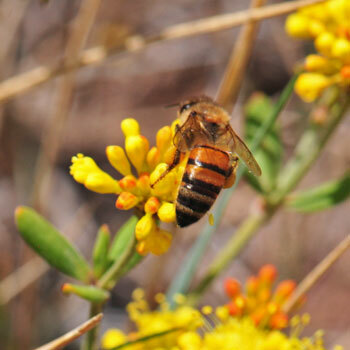 Eriogonum is found throughout Arizona and entire southwest with 58 species in Arizona, 115 species in California, 36 species in New Mexico, 79 species in Nevada and 67 species in California. All data is approximate and subject to taxonomic changes. The genus Eriogonum is well represented in the southwest and in Arizona both for species numbers and individual populations. Comments: Eriogonum umbellatum is extremely variable and difficult to identify particularly down to one of the 30 varieties. The common name "Sulphur Flower", referring to the yellow color has been used to describe many of the closely related similar species. Sulphur-flower Buckwheat should not be considered a "desert" species preferring elevations above 5,000 feet although species may Curr in high-desert transition areas. May be considered a "desert" species in California at 600 feet elevation. Eriogonum umbellatum provides an important source of seed for birds and nectar for moths and butterflies; Various species of Eriogonum play host to the larvae (caterpillar) of several butterflies including the Mormon Metalmark butterfly (Apodemia mormo), the Rocky Mountain dotted-blue (Euphilotes ancilla) and the Lupine Blue (Aricia lupini). 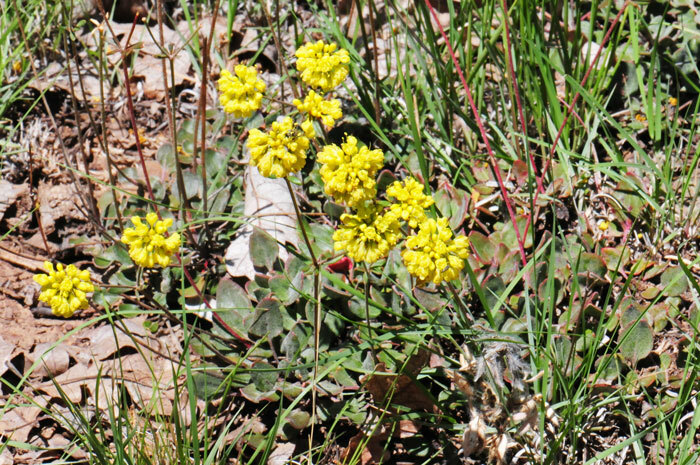 The Sulphur-flower Buckwheat is host to the Rocky Mountain dotted-blue (Euphilotes ancilla) larvae and adult as well as the Lupine Blue (Aricia lupini). Eriogonum fasciculatum is also a host species to larvae of the Lupine Blue and the adult butterfly feeds on flower nectar. 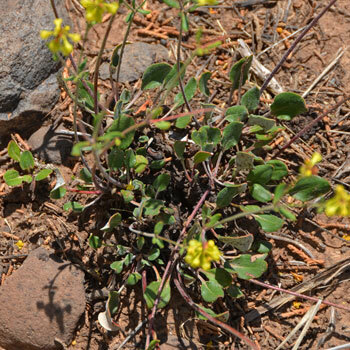 In Southwest Desert Flora also see Abert's Buckwheat, Eriogonum abertianum, Skeleton Weed, Eriogonum deflexum, Flat-top Buckwheat, Eriogonum fasciculatum, Desert Trumpet, Eriogonum inflatum, Little Deserttrumpet, Eriogonum trichopes, and Wright Buckwheat, Eriogonum wrightii. Kawaiisu Drug, Dermatological Aid, Mashed flowers used as a salve for gonorrheal sores. Mahuna Drug, Gastrointestinal Aid, Infusion of blossoms taken for ptomaine poisoning. Navajo, Kayenta Drug, Disinfectant, Plant used as a fumigant for biliousness. Nevada Indian Drug, Cold Remedy, Infusion of roots taken for colds. Paiute Drug, Analgesic, Decoction of roots taken for stomachaches. Shoshoni Drug, Orthopedic Aid, Poultice of leaves, and sometimes roots, applied for lameness or rheumatism. Blackfoot Food, Beverage, Leaves boiled to make tea. 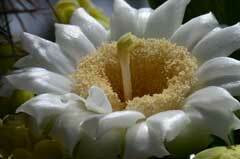 Cheyenne Drug, Gynecological Aid, Infusion of powdered stems and flowers taken for lengthy menses. See ethno-botanical uses at Native American Ethnobotany, University of Michigan, Dearborn. Craig C. Freeman, James L. Reveal, FNA, | Family List | FNA Vol. 5 | Polygonaceae | 107. 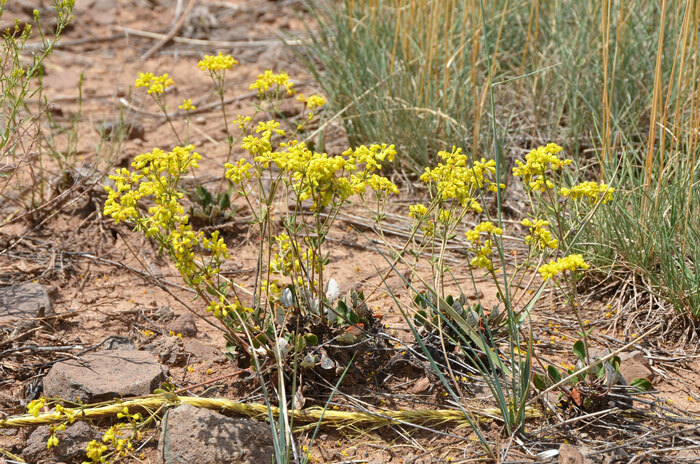 Eriogonum umbellatum Torrey, Ann. Lyceum Nat. Hist. New York. 2: 241. 1827. Flora of North America Editorial Committee, eds. 1993+. Flora of North America North of Mexico. 16+ vols. New York and Oxford. The Plant List (2013). Version 1.1. Published on the Internet; http://www.theplantlist.org/ (accessed 06/02/2016). Native Plant Information Network, NPIN (2013). Published on the Internet http://www.wildflower.org/plants/ [accessed: 06/04/2016]. Lady Bird Johnson Wildflower Center at The University of Texas, Austin, TX.